Actos attorneys Rhett McSweeney and David Langevin are providing free legal consultations to individuals and families injured or harmed as a result of type-2 diabetes drug Actos. Give us a call or use our private contact form. The FDA has issued a safety announcement about the risk of bladder cancer for those taking the type-2 diabetes drug Actos. 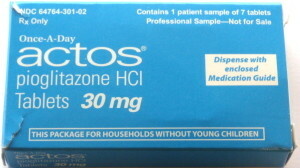 The Actos safety warning follows a five-year Actos study suggesting long-term, high-dose use of Actos may increase a patients risk for bladder cancer. This increased risk may be greater in men than in women. In response to the study, the FDA is warning that Actos should not be used in patients with active bladder cancer or in those who have a history of bladder cancer. There are also reports of heart related incidents, such as heart attack, stroke, and congestive heart failure while using Actos. Did You or a Loved One Experience Any of The Above Symptoms or Injuries? Please feel free to contact one of our Actos attorneys using the form below or by speaking to us at 1-877-542-4646. Our Actos lawyers will evaluate your claim for free.